Explore the northern part of the Coastal road – Kystriksveien, by bike. The tour usually begins in Bodø and includes the wonderful archipelago with the islands Sørarnøy, Sandhornøy and Støtt. In the south lies Svartisen, Norway's second largest glacier. In the north you will visit the world's strongest maelstrom Saltstraumen. For visitors who want a 3-day bike tour, we recommend this trip which begins with a nice boat trip from Bodø to the archipelago in Gildeskål. Underway, you will experience magnificent nature with lofty mountains and long sandy beaches. The bike tour goes to Saltstraumen and continues to Gildeskål with lofty mountains and long sandy beaches while ending up at Norway’s second largest glacier, Svartisen. On this tour, starting at the municipal centre of Inndyr, you can experience the archipelago in Gildeskål. The tour includes Sørarnøy, Nordarnøy and Sandhornøy. The north part of Kystriksveien has a lot to offer for those who want a bike ride in the beautiful scenery. A tour, starting in Bodø will include cycling along road 17 with some challenging parts, but also island hopping and cycling in flat terrain close to the sea. If you are looking for a 2-3 day trip, Inndyr in Gildeskål would be a good base for trips to the islands Sandhornøy and Sørarnøy. You can also rent bicycles on the island Støtt and at Ørnes. Svartisen is one of Norways best nature experiences. From Ørnes, you can rent a car and quickly get to Norway&apos;s second largest glacier. Brestua, located next to the glacier offers both accommodation and good food. A trip to Svartisen should be a half day or a full day trip. The best way to experience the glacier is to join a guided tour. This should be booked at leas tone day before. Do you want help planning your trip, book accommodation, transport options, and tips for activities along the way. Please contact us by phone 74 40 17 17 or send a request from our tour planning form. 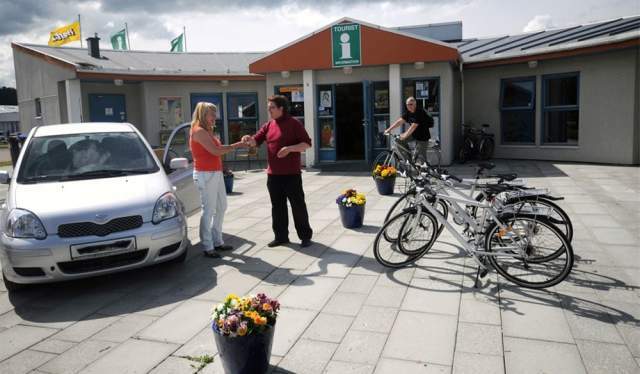 You can rent bikes in Bodo (tourist office), støtt Brygge or Ørnes Hotel (both in Meløy). In Bodø you can choose to pick up the bikes at the airport. Bicycle rental includes helmet, bags, pump, and tool kit. Booking by phone 74 40 17 17 or book online. Kystriksveien Reiseliv now offers luggage transport for cyclists along the Coastal road - Kystriksveien! We will bring your luggage from place to place. It will make your trip more enjoyable. Offer valid from Stjørdal (Trondheim Airport) along Kystriksveien to Bodø, including islands. Luggage transport must be pre-booked in advance. Online booking for Bodø, Brønnøysund, Sandnessjøen, Rørvik, Namsos, and Steinkjer. Fly with Widerøe to Namsos, Rørvik, Brønnøysund, Sandnessjøen or Bodø and start your cycle trip from the airport. You can pick up and deliver your bike at the airport. An easy way to start exploring the coastline between Namsos and Bodø.